"When In The Woods I Wander All Alone"
Edward Hovell-Thurlow was an English poet who inherited the title of the second Baron Thurlow on the passing of his unmarried uncle. As well as writing his own poetry he also acted as an editor for other poets, in particular the Elizabethan-era writer Sir Philip Sidney. He also filled a number of interesting sounding official posts including Patentee of Commissions in Bankruptcy, to which he was appointed in 1803 and Clerk of the Hanaper which came along in 1821. He was born Edward Thurlow on the 10th June 1781 in the central London area known as Temple into very comfortable circumstances. His father was titled Bishop of Durham while his mother Anne was the daughter of Chancellor Thurlow, a lord, who was also the 1st Baron Thurlow. He was sent to be educated at the prestigious Charterhouse School, going on to Oxford’s Magdalen College. He matriculated from Oxford at the age of 17 and gained his Masters’ degree on the 16th July 1801.
to King Henry V and Thurlow applied for a royal licence to use the name. This was a continuation of the story told in The Tempest. parodied by Lord Byron. He found the time to write in between the responsibilities of his numerous official posts, all of which he retained until his death. 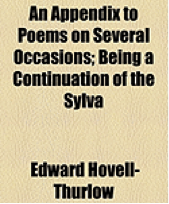 Edward Hovell-Thurlow died in Brighton on the 4th June 1829, six days before what would have been his 48th birthday.